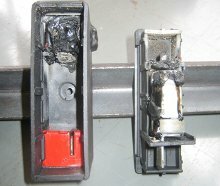 These fuses in fig1 were discovered in a working control panel at a Birmingham based manufacturer using thermal imaging as a predictive maintenance tool. This annual survey was just in time to save the company from loss of production, if not a major fire. 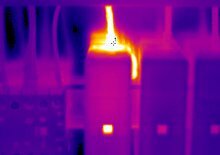 Comprehensive thermal imaging of the electrical systems is well known, but significantly under used, as a predictive maintenance tool, meanwhile the short to medium term benefits are massive. Using its own Thermal Imaging camera E9 surveyed all the electrical systems from the substation and main switches through to individual machine control panels at the manufacturer in Birmingham. Contractors had installed some new control systems in the panel of a core piece of equipment. The work had been completed and the equipment operated for several months. The camera revealed problems at a glance that were not visible to the naked eye. The environment of the equipment meant that potential burning smell were shielded by the background aromas. The images below show the problem area. During the survey it was clear that several connections were overheating. This is usually due to a connection working loose (alternating currents can work nuts and bolts loose over time especially if they are not to the correct torque setting on installation. Close inspection of the panel showed that temperature was over 120C in the panel. When extracted there was clear heat damage to cable connection. The electrical maintenance team went to work immediately on the repair. Equipment was taken off-line, new fuses and holders were ordered the equipment was returned to manufacturing service in first class condition in time for the next day shift. Thermography (another word for thermal imaging) had highlighted a serious issue on the brink of failure, however, this technique will pick out the signs of failure much earlier allowing repair to be made in less dramatic circumstances. Thermal imaging is both quick and inexpensive and without impact on production efficiency. It is a non-invasive technique and should be undertaken during times of peak production. The cost benefits are large. Reduce the risk of total loss by fire. In addition many insurance companies accept the technique as part of wiring inspection. Some insurance companies will offer insurance premium discounts for users of annual thermal imaging users, because this lowers the companies risk profile.